Centerplate and Sun Life Stadium have a very firm uniform dress code and appearance guidelines. It is of the utmost importance that every volunteer follows these guidelines to ensure a professional experience for our guests. Black long dress pants appropriately fitted (Dickies or Dockers); clean and pressed (supplied by the volunteer) – pants cannot be too tight, revealing, baggy or loose that undergarments are visible. A belt is expected to be worn. Uniform shirts will be issued to the group the first event the group volunteers for in the 2015-2106 event schedule. A group representative will sign for and receive a certain amount of uniform shirts needed for your organization for the 2015 – 2016 event schedule. The uniforms tops are issued and documented per organization. There will not be an upfront charge for the uniform tops. All uniforms tops must be returned to Jemmy Jasmin or Aryelle Williams, counted and documented, within 2 days of the organization’s last event volunteering. If the uniform shirts are not returned, counted and documented Centerplate will charge the organization for the cost of the uniform tops. The cost of each uniform top is $25.00. Visors will be issued to the group the first event the group volunteers for in the 2015 – 2016 event schedule. A group representative will sign for and receive a certain amount of visors for the organization for the 2015 – 2016 event schedule. The cost of the visors $5.00 will be directly taken out of the group’s commission. Each uniform deduction will be itemized on the group’s event statement. If a volunteer does not have a visor the group will need to pick up another visor at the uniform room and sign for it to be taken out of the group’s commission check. Visors are non-returnable and non-refundable. A Centerplate ID Badge authorizing a volunteer to be at the Stadium will be issued to volunteers each event. Each volunteer will check in with Centerplate personnel providing ID with full name and date of birth. All volunteers are required to turn the ID Badge in at the end of every event. If an ID Badge is not turned in the group will be charged $10.00 for the cost to replace the issued badge. Hair must be kept clean and neatly combed or styled. Hair at or below shoulder length will need confinement. Hair must be a natural color. Any extreme colors or unnatural colors are not permitted. A neat, natural style and clean shave are essential. Mustaches must be kept neatly trimmed. Fingernails must be kept clean and neat. If fingernail polish is used it must be clear or in single, traditional color. Fluorescent or non-traditional colors and nail appliqués, designs and/or nail jewelry are not acceptable. Fingernail length may not extend past the fingertips in food preparation areas. There are no exceptions to this rule. 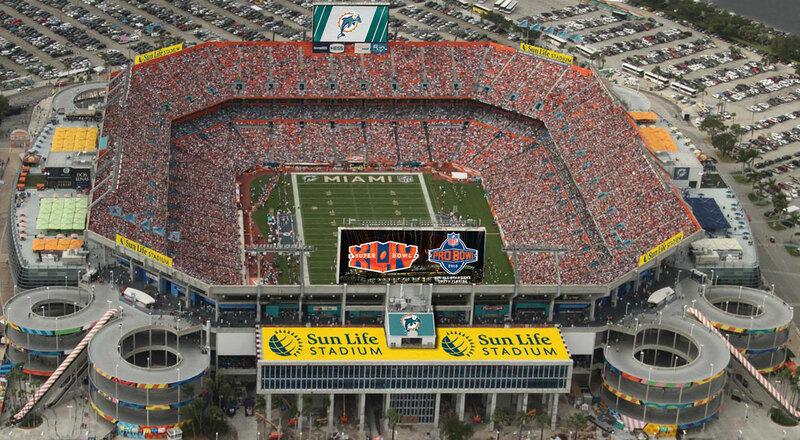 Facial piercings and visible tattoos are not permitted within Sun Life Stadium. A single post earring on each ear is permitted for female employees (dangle or hoop earrings are not acceptable). Earrings are not permitted for male employees. Necklaces, bracelets and ankle bracelets may not be worn while in uniform. Medical alert jewelry is allowed. Due to close contact with guests and fellow employees, the use of antiperspirant or deodorant is required. For the same reasons, the use of heavy scents and fragrances are not permitted.